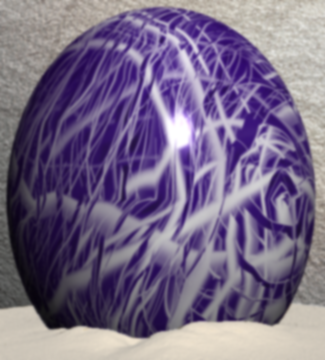 Craggily cracks appear to splinter across the surface of this egg. Maroon, burgundy, and garnet swirl around the fractured surface. Some places inch closer to black while other areas are bright ruby only to be shattered, like a piece of glass that has had a rock thrown at it, splintered in every which direction. The crack lines run sporadically, no apparent pattern as it leaves clumps of different colored reds settled next to each other. Perhaps the egg was a stained glass painting once before it was dropped upon the floor and all the pieces haphazardly put back together again. None of the pieces quite seem to fit together and yet it could almost be considered beautiful, in the frenzied way the reds come together. Blanket of Ice is all engulfing. While you could swear that you were on the hatching sands, touching this egg, you are now transported to a land of white. Bitter wind assaults your skin, biting, nipping, clawing as snow and ice whip by. You start to shiver, craving the heat of the hatching sands as an eerie howl blasts by your ear. Your head whips around and you try to track the sound and a sense of fear starts to creep up from the pit of your stomach. There's an overwhelming feeling of anger being aimed at you. Anger at having been awoken from its slumber. 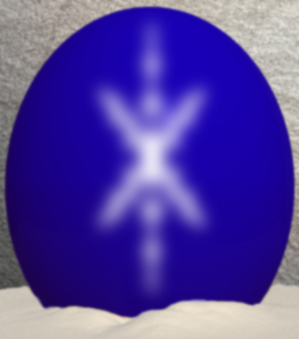 Another burst of air is thrown at you as the egg's consciousness shoves you away. Leave. You are not welcome nor wanted. Blanket of Ice has lost some of the frigid blizzard of anger it had previously displayed. The storm seems more subdued now and you may even be allowed to walk around and explore the expanse of white instead of sitting there shivering in place. There's still that sense of irritation that seems to be directed at you, but there's also a sense of curiosity about one who would dare touch again. So brave! Perhaps the consciousness was wrong about you. It pokes and prods, sending icy shards against your mind, searching for ways into your mind. It can't be a pleasant experience and as the pain intensifies you try to escape, try to remove its arctic hold. Just as you start to cry out in pain you're shoved away. Freed. Blanket of Ice is finally spent, the snow now rains down in fluffy fat flakes. It could almost be relaxing here, if it wasn't so sharding cold! Since there isn't a raging blizzard going on, you can finally make out the frozen form not too far from you. A snowdragon sprawls out before you, and when you approach it, its head whips around and swirling eyes stop you in your tracks. It's wondering more about you, but this time it isn't stabbing your mind while probing around. This time it's gently wrapping you up in a blanket of snow, which is surprisingly warm, as it lures you closer. It wants you to share your innermost secrets. Regale it with stories of your past. It's definitely curious, although be warned, it's not always the wisest thing to tell. You never know when it might be… used against you. The color of this egg reminds one of the sky at dusk as the blues of day give way to the deeper purples in the fading light. Here and there, a crystalline intaglio of fine white and gray lines emerge out of the fathomless illusion of depth that the deep color provides to seemingly float closer to the surface, like fine spinner webs or cracks in thawing ice. The effect of this combination is twofold. First, new patterns may be found in what seems to be the interior crystalline structure of the egg, as the thin lines of white weave themselves together Second, it becomes clear that although it seems you're looking into the depths of the egg, it's just a surface pattern that provides the illusion of depth, endlessly drawing your eye into its center, when in fact, of course, it's just a shell. Occasional Moments of Absolute Genius becomes aware of your reaching out immediately and welcomes your thoughts and all of their new possibilities. In kind, you find yourself accepted, without judgment or question, without test or key, simply by virtue of who you are. You are invited into the swirling excitement of a personal adventure. This mind leaves the destination of that adventure to you though, it agrees to follow where you might lead simply because it trusts that whatever the destination, the journey contains the lesson, and it craves what you might teach it - Are you brave enough to take the first step? Occasional Moments of Absolute Genius accepts your leadership and begins the journey. It shows you a little more of itself. You learn that it is young and yet mature in some ways. It accepts all things as they are, just as it has accepted you, and from that acceptance of what is, shapes a greater possibility, crafting a result that is greater than the raw material. Your mind is more deeply explored, looking for that raw material. Your past, your faults, tears shed long ago as well as the laughter become iron for the creative forge. You are brave for sharing so much. What will be the result? The difference between genius and failure is often a matter of bravery. Occasional Moments of Absolute Genius is ready. All has been shared. You find yourself drained by the depth of the communion. Nothing is secret anymore. Must you be so exposed, so tested, so venerable? Is the treasure at the end of the journey worth it? Then insight strikes. You were accepted at the beginning of this journey. There was no testing, no judgment, your bravery and character alone is sufficient. Your faults, now known, have only tempered your strength, as iron becomes steel. All your trials have been driven by purpose. You need be nothing other than yourself, forever for you were crafted to be sufficient for the task from the beginning. This mind has offered you the realization that all things in life work together for good, even the trials that strengthen you. A treasure indeed! Every test that was and will be — has just been passed. Speckles of brown and white striations disturb the otherwise consistent expanse of pale, blue-green. The freckles become more and more dense and finally come to settle at the rounded bottom of the egg like sandy sediment. A strand of foamy white is almost starke against the aqua blue surface of the egg which deepens to a more vivid azure along the upper half, streaked with wispy ribbons of pixilated white. Eggs Gone Wild stirs as if dragged from slumber after a very long night with protestant moans that haunt a chaotic mix of blue and green. Disoriented. Confused. Groggy. Oh, it's not happy, no, it was sleeping, dreaming, sheltered in the comforting dark before alertness and light drive pulsing throbs of pressure all around. Eggs Gone Wild is tense until the throbbing fades then slowly it is as if laughter itself has a face though near indiscernable, it is simply a burst of joyous hue that brightens the darkness. Come with me! We're only young once! So much to do and see, live it up, don't waste a single moment! White ribbons flutter and whirl around, delving inside, testing, feeling, searching, seeking a kindred spirit, the sensation almost tickling your spirit. Eggs Gone Wild slowly starts to withdraw, tendrils of white retreating, color fading, hints of blueish green fading slowly as echoes of laughter play out into quiet. Back to dreams of adventure, back to the shelter of the dark, back to the place where one soul waits for another to make them both complete. This egg is shattered and broken! At least it appears to be from a distance. Thin lines are scattered about its surface, forming an array of sharp cornered shapes. The egg is generally a cloudy white, though some of the pools are gentle shades of grey. This makes the surface look rough and pointed in areas and only adds to the shattered looking effect. 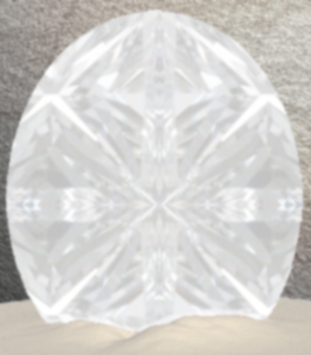 Each of the individual shapes though looks smooth as silk and almost flat. A Crystal Clear Sea politely eases its way into your mind. You can feel it following a path you've made for it, carefully stepping along your footsteps and anxious to keep up with you. It sees what you want it to see, it fills the crevice you allow it to fill. It is hesitant to look around unless it feels you guiding it. A Crystal Clear Sea stops at this memory. Even as you ease forward, it remains behind, sunk in a hole and captivated by this section of your mind. Before it had been so easy to move, it was eager to follow you. Now it is stuck, thinly probing. Why this memory? It was neither painful nor happy. But this presence it finds it… beautiful and captivating. A Crystal Clear Sea starts to devour memory after memory with a seemingly insatiable appetite. It races through your mind and washes over you, casting you aside while you try to keep pace. But it's moving too quickly and in too many directions, and is thinning and spreading. Slowly it moves away becoming fainter and more distant until you cannot feel it with you anymore. 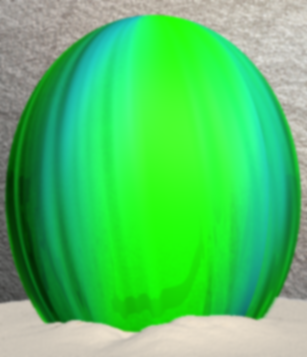 If it's not easy being green, then it's extremely hard for this very green egg. Smooth and shining, it's shell has been divided into a multitude of bright facets and each one of them is a different shade of emerald. It's as though life itself has fractured upon the surface and scattered into every possible hue nature could provide - the dark agate of soft moss, the sun-kissed green of leaves in the morning, the pale blue-green of algae, the smooth verdance of a meadow, the lush tones of foliage and more variations that can't even be properly described. It's a breathtaking collage of colors that is entirely hard to process all at once, as each section needs to be viewed on its own - together it flows into a roiling sea of shining emerald tones. 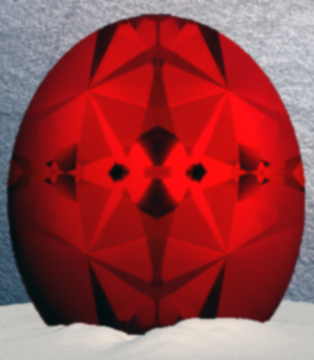 If plant life itself could be cut, polished and displayed it would certainly look like this egg. Nature's Rhythms softly caress your mind, churning into life on the tail end of a warm spring breeze. A rolling beat starts to thrum underneath your fingertips, the tempo primal and oddly familiar. Whoosh. Swish. Phantom winds swish in time with the rhythm, the breezes bringing crisp fresh scents of greenery and florals that tease your senses. The sound of running water flows in the distance, the bubbling and chattering adding a new layer of natural music to the steady thrumming that vibrates through the very fiber of your being. A soft rustling of leaves. The creak of a branch. Everything comes together into a natural melody that ebbs and flows around the beat. A presence seems to dwell within these idyllic surroundings, wrapped warm and comfortable amongst the soothing sounds that rush between your ears. It sends out a caress - an almost nurturing and comforting touch of wind that brings forth memories - warm, happy and secure. Memories that make you feel comforted and protected amidst the rhythms of nature. Leaves swirl in what could almost be considered a laugh - mischievous, maybe, though it disappears too quickly to tell for sure. The beat soon slows and then fades with a lingering sigh of wind, leaving only a hint at what might still be left to blossom from this fertile mind. Nature's Rhythms fills your mind with a rush of wind, the strong breeze twirling through your mind with excitement and energy. Bits of leaves, grass and flower petals are stirred up in a great rushing chatter, the noise cascading in a mockery of a laugh - obviously the presence is happy to see you again. A veritable waterfall of scents flows with it - fresh cut grass, leaves in autumn, spring water, flowers and every other smell you happen to associate with greenery. Ba dum. Ba dum. Hidden beneath the rush of nature sounds thrums the beat, its primal noise deep enough to vibrate through your fingertips. ba dum ba dum. It's quicker now and more lively, as though life is starting to course through it as the presence within wakens more. It's a soothing background to the steady swish, creak and flow of leaves, foliage and fresh water that make up the chorus of nature's melody. Everything around you is more lively and bouncy - the water burbles and rushes over rocks and stones, the leaves brush together in huge gusts of wind. A cyclone of leaves surrounds you in reckless abandon as the presence draws forth more memories - memories of fun, happiness and good times. Parties, adventures and laughter. You can feel the energy in the beat now - rapid and full of the love of life and the need for exploration and adventure. There's a final fluttering of leaves that brushes over your mind with a gentle softness before everything goes silent and still. You're only left with a lingering floral scent and a slightly elevated heartbeat that's still straining to stay in time with the hidden rhythm. Nature's Rhythms flows into your mind with a languid motion akin to wind blowing through drooping branches, the movement subtle and relaxing. Ba dum dum. Rumbling and deep, the rhythm starts to pulse through your fingers in a lazy kind of way - soft and insistent, steady as a beating drum. It seems like the presence within has settled into a contented lull - perhaps tired after the energetic excitement from before. Wind blows through your mind like a sigh, bringing with it soothing scents of lavender and jasmine along with a hint of fresh pine. There's the sound of water rolling lazily over stones, bubbling and slow and full of a soft rushing - nature's melody. All the while the beat goes on - ba dum, ba dum. All the sounds of nature come together to form a simple lullaby. Phantom winds brush at leaves, bringing forth a crescendo of sound that tickles at your consciousness. The presence, as sleepy and relaxed as you suddenly are, draws forth a few more memories in a steady trickle - lazy days of happiness, carefree moments in nature and soothing melodies from your past. It almost seems to sigh in contentment at each new image, the wind swirling and blowing through your mind with its pleasure at these new things. Ba dum … dum. The beats begin to slow, the vibrations coursing through your fingertips. An echo of wind suddenly breezes through you, the noise almost like that of a yawn. Life has so many facets - security, energy and just enjoying the moment. But life for this presence is still blossoming - who knows how it will end up. A final whisper of leaves and water and everything falls still once more, leaving you with a final note of soothing peace and tranquility with a hidden reserve of life's energy. As if highly polished to a rather iridescent sheen, a lustrous coating of shimmery pale hue clings to the rounded curve of the small egg. 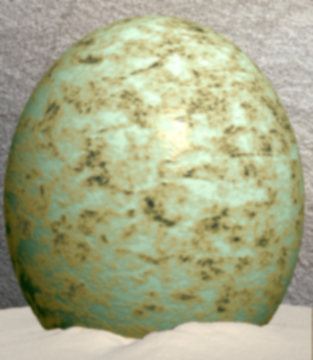 Curious in shape, rather more round than oblong, and perhaps one of the smallest eggs in the entire clutch; an air of ethereal innocence enshrouds it. 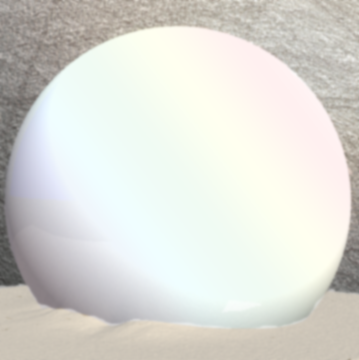 Pale and small, a faint sheen of oily rainbow coating overlays the pearly seashell and snow coloration of the eggshell allowing it to glisten and shimmer in the warmth generated within the Hatching Ground. 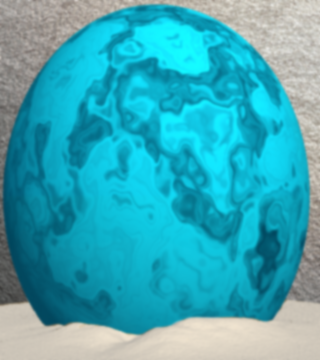 There is an aura of unearthliness about the egg, as if such treasure might be found not upon the sands in which it lies, but rather in the mysterious depths of a tropical sea. Pomp and Circumstance enters your thoughts, stage-left, marching forth with a mental trill that would sound suspiciously like a trumpet as the presence within reaches out, enfolding you in a clasp like the welcoming handshake of the harper tutor — were you so lucky to have one — that finally declared you free of his or her lessoning. The unborn dragonet's mind greets you, friendly — oh so friendly as a wave of emotions surface, a child's glee at seeking and learning. Probing at your thoughts, images flicker — a wave of shapes and color rolling past you with a few glimpses of potential that lies within. They flash past, too quick to really make out individual pictures. And then, the mind quiets, lulling into a silent limbo, biding and waiting to see what you make of it. Pomp and Circumstance booms back into your mind — a rolling thunderous drumroll that builds and builds into a climatic finish as once more the dragon-child reaches out, mentally probing and investigating like some sharp-minded little harper apprentice. Again, the visions flicker, only this time, after your acceptance, they are brighter and more visible — time slowed to a crawl for your perusal. It almost seems that this youngling is asking you: What will I be when I grow up? The images are clear enough, drawn perhaps from your own experiences and observations of the world — or perhaps from others as well. A stylish holder, wearing all the the latest fashions, a harper, entertaining the crowd with jokes and laughter, or that same harper, surrounded by adoring admirers in some big stage performance. There are other visions — your thoughts savored briefly and then tucked away into a gleaming shimmer of endless white. Memories are tasted, studied and understood. Brightness flares, the mind within withdrawing for a moment to brood. Pomp and Circumstance lingers reluctantly in a muted glow of white — you sense a desire to be free, of spreading wings and soaring on the breeze — but entrapped within darkness and silence, there is but little escape. Only time, that steadied progressive march of day and night brings the moment closer. And what moment could this be? A silence stretches on, the young mind within the egg sending feelers out through your thoughts, living the world beyond through you. From you, it has learned — of the choices that lie ahead. For the third time, the visions come — only changed now, new feelings and emotions. Kindness and generosity — of loyalty and love. Of the debate and argument, and the thrill found therein. Slowly, the radiant glow about you begins to brighten again, drawing away into brilliance. A final feeling remains to you — the enjoyment of the finer things that life has to offer. Consider it, feel it. And perhaps in time, know it. With that, you are alone, free to go and experience life beyond the shell. Never one to give the first impressions that might lead to the conclusion of monochromatic pigment encasing the rounded curve of eggshell, continued observation over a period of time emboldens the convictions of that first glance. 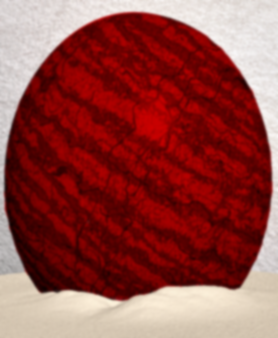 While indeed, the base color of the egg itself is of a garish glossed shade of fresh-spilled blood, variegated veins of dark magenta and burgundy of a hue dark enough to be nearly black juxtapose themselves across the shell in a curious pattern — an illusionary pattern of planes and angles that almost seem to give the medium-sized egg a faceted appearance. When tilted just so, in the heat that shimmers up from the warming sands below, one might almost see that the egg seems to resemble a heart, clasped in the pale embrace of the sands around it. Pinwheel Starburst Firecrackers does not so much greet you as reach out and wrap you into darkness. There's nothing to fear, though, just a smooth velvety-black feeling, like that of a warm blanket wrapping comfortingly around you — inky night slowly and surely settling about you. And then there's a loud piercing whistle through your thoughts, distrubing the quiet solitude of the darkness about you before CRACK — a resounding boom that you almost feel rather than hear echos through the night, a starburst explosion of light and color accompanied by a bubbly enthusiastic presence immediately felt. Why hello! Who are you! Thoughts probe at yours, a friendly cheerful sensation greets you, testing you, and learning about you. Pinwheel Starburst Firecrackers gathers the darkness again, but not so enfolding this time, snuggling it around you like the cloak of the night. And again, there's that piercing sound of a whistle, and POP POP two more bursts of color — this one a bright red and a deeper green — throw starry patterns across your thoughts. Into that momentary distraction and dazzlement steals forth once more that cheerful presence, wafting a sense of humor. Why did the chicken cross the road anyway? So a runner walks into a bar, and the bartender says, why the long face? These images are flickers across your mind — a joke shared and traded. Did you know dragons could joke in the shell? Neither did I.
Pinwheel Starburst Firecrackers gives a screeching whistle, a loud ringing sound that echos and echos within the inner part of your mind — a sound heard not by human ears, but by mental ones. Flashes of images appear before you, a kaleidoscope of color, light and sound that filters past you in an unending panorama. A flutter of cloth — fine clothing, fashionable styles plucked from your own thoughts for surely at some point in time you've seen someone who dressed nice. Well, that's one memory. A flicker of spontaneity — flying upside down above the ocean, quickly righted. A sense of dedication and a feeling of pride in hard work surfaces, floating past you. And then, a sudden burst of color and light, a flurry of whistling cries and an overwhelming spatter of mental fireworks are set off. This is it, the grand finale. The scent of brimstone and smoke fills your nose, so sharp and tangy you can almost smell it .. NO, you CAN smell it. The bombardment of colorful flashes continues, almost too much. And then a swelling crescendo sounds, and all goes quiet. Darkness shrouds you, cloaks you and then fades. The presence is gone. Sand and sun appear to have roughened and weathered the once smooth features of this egg, creating a textured look of aged parchment that almost begs to be touched. Smooth waves of honeyed gold spread over a layer of deep green, creating a flawless peridot hue beneath the grainy overlay. Ripples and waves stir the soft yellow-green hue, each subtle fold of color forming verdant hills and dunes that rise and fall majestically over the shell. Polished and smooth bits of emerald, saturated throughout with a layer of gold, peek out from the roughened shell like hidden pockets of beauty within a desert sandstorm. Flecks of a deeper green have managed to escape the weathering effects of the phantom winds and sands, though they still have soft undertones of yellow that make them blend in seamlessly. Veils of Heat rise in languid waves, enveloping your mind in rippling layers of invisible warmth. It's as if the heat of the sands has started to leak in through your ears, filling every part of you with liquid sunshine coursing hot and quick through your veins. Phantom winds swish and blow, sending soft feathery caresses of sand whirling across your mind in a miniature sandstorm. A bright orb of golden light perches regally above everything else amidst the roiling grains of sand, its very radiance the source of all the heat pressing in on your mind. . Rays of pleasant warmth and light spread out from it, turning the surrounding area beautiful shades of gold, red, orange and yellow. You find yourself subtly drawn to the bright spot, as though it were a large shining magnet inside your brain. More than warmth and pretty colors emanate from it, though - basking in its noble presence you seem to be absorbing confidence, security, safety and caring all in one. In turn it draws a little back from you - memories of praise and appreciation that mingle for several seconds before they are blown away by wind and sand. Slowly the heat begins to dwindle and the sand begins to settle, the soft illumination fading away into darkness. The sudden absence of heat gives you a brief chill, though a lingering feeling of warmth and contentment stays with you. Veils of Heat draws you in with its bright corona of warmth, its shining presence spilling over you with its self-assurance and confidence. Sand whirls and twists, individual grains sparkling in the radiant lightpulsing forth. Sizzling heat slips into your veins again, warming you to the core and bolstering you with some of its boundless stores of confidence. Every passing second makes it feel as though you could do anything or be anything - only if you could stay within the glorious golden presence within this egg. Winds stir, sand blows and the shining orb of light sparkles in its lofty, regal position on high within your mind. For several seconds you merely bask in its presence, soaking in all it has to offer. Then, a sudden whoosh of hot air swirls through the crevices of your mind and sends a rush of sand into your consciousness. Vague feelings flicker into life amongst the heat and warmth - the want for togetherness and peace, the need for prestige and honor, the hunger for appreciation of its actions. All this rushes past you in a blast of liquid heat that soon dissipates into nothingness. The sand drifts away and the light fades into darkness, though there is still that lingering feeling of contentment tingling in your limbs. Veils of Heat roll over you like a warm blanket, sinking deep into your pores and settling in comfortably like an old friend. Dry winds swirl and churn within your skull, stirring up grains of sand that twinkle in the light of the golden orb still perched high above like royalty. Rippling waves of light pour over you in waves, each one like a jolt of self-esteem and warmth. Sand stirs and dances, the grains lightly caressing every thought that comes to your mind and adding a soft film of gold to it - the presence seems intent on making everything better and bright no matter how horrible the memory might be. It showers you with gifts of its own warmth and stamina, as well as its overwhelming feeling of safety and security. Wrapped in a dazzling array of golden illumination, it almost feels as though nothing can touch you and you could do anything you set your mind to as long as you are basking in its magnetic presence. It would be bliss to just sit soaking up the warmth, favor and confidence this intelligent mind sends out with every pulse. Free though these golden gifts may be, there still seems to be a craving lingering amongst the swirling grains of sand, dry winds and golden heat - the need for appreciation and acknowledgement. It reaches for you and caresses your mind with a feathery soft tendril of hot sandd as it seems to ask for something simple in return - a thank you. It then draws away with the last breath of heat, sand and wind, though it leaves with you the lingering potential of that golden light - what could be accomplished if you were the one destined to soak in its glorious warmth. Pallid sky coats this egg, such a gentle color, playing across the shell as if dancing in the wind. Streaks of near white slice across the background, converging in the middle to form a narrow spindled six-pointed star. This star gleams and shines, all the while a bright circle pools at the middle, nearly glowing in the eerie hue of periwinkle. On closer examination the sky hue is actually a combination of several different colors, some floating their lazy way across in denim while others cling to azure and powder blue. Moonbeam soft tufts flourish into lazy cloud like entities that almost appear to float across the shell. But alas, there is only movement if one is walking by it, a trick of the gleaming polished surface. Cling to the Green is outstretching arms of welcome. A world flourishes up around you, a sea of green in the form of trees, shrubs, and grass. The sounds of children's laughter can be made out and everything feels so.. at ease. It's that perfect time before the green starts to lose its battle. There will be none of that colorful autumn stuff here! Green! Green! Green shall reign supreme! After a few moments pass, and perhaps you grow bored of the verdant surroundings, you try to pull away but suddenly feel pressure on you. A feeling consumes your mind, a stubbornness, the kind where someone has dug their feet in and refused to budge. No! You can't leave the green! You can almost hear its upsetting cries and you try to withdraw again. It clings, and tugs, and tries so very hard to keep you here. But finally you are able to escape, leaving with only one thought: The green shall survive! Cling to the Green has not changed its world much, the green is still a primary color, but it seems like it's losing power, losing intensity. But the lazy laughter that made you want to crawl into a hammock and relax the day away, has not left. You can almost make out the form of small children running by you, throwing a ball perhaps or playing a game of tag. The smell of freshly cut grass envelopes you before the curious tendrils are sent seeking you out. Do you like green? The hue of nature, living, breathing, being. If not, this is not the place for you, it warns. For there will always be this draw to green, the color of life. Perhaps that's why it is so drawn to you, even though you obviously are not green. But you are life! You are living! You feel that cling again, a tickling, prickly sensation trying to draw you closer as it learns more about what you know about a life of green. There has to be something green in your life… and yet you start to struggle, and fight against the invasion. Tighter and tighter it holds until finally you rip yourself free and you are left with aftertaste of wheatgrass in your mouth. Cling to the Green is silent when you arrive. While the lush world is still sprung around you, something feels, off. You reach out to rub your finger across a velvety leaf and you pull your finger back as something wet coats it. 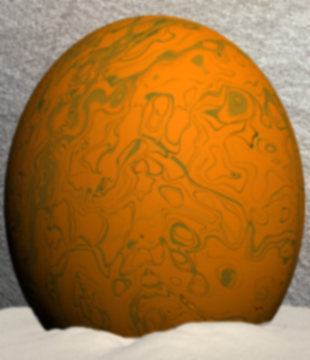 The color of brown slips between your fingers and yet the owner of this egg is nowhere to be found. As you turn around, you watch as the world slowly starts to melt. Huge clumps of green slide off the trees and crash upon the ground, coating anything near in brown paint. First it's the trees, and then it's the bushes, exploding their green leaves in a fit of chocolate hue, leaving behind nothing but a gnarled mess of barren twigs. The grass beneath your feet yellows and turns brittle before finally there is nothing but dirt. Ugly, awful, /brown/. Finally the owner's emotions can be felt, anguish, pain, horror! Its green! Its beautiful, wonderful green! It's whirling into a great hurricane of verdant before it picks you up. It will save you, save you from the sea of brown! The sea of death! And then you're free, back on the sands and left once more with a passing thought: Green is good! 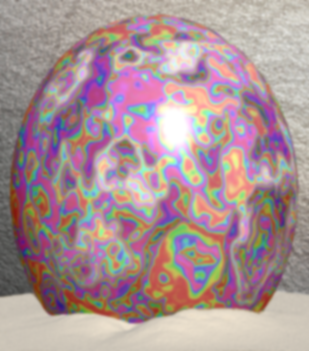 Flashes of liquid fire roll beneath this egg's surface, the shell merely a window to the chaos and colors within. The juxtaposition of color is complex, with green morphing into violet when the angle of viewing is changed, while red and orange explode in crystalline sunbursts, then dim to a steady yellow flame. Transcended from prism to prison, captured light refracts in infinite pursuit of freedom, hue stacked upon tone to give additional illusion of dimension. Striations on the shell buckle through the shimmering color, stress marks crazing the glossy surface as though the occupant within were testing the bonds of its captivity. Footsteps in the Night start off slowly, padding softly out of the darkness, a solitary sound. Abruptly, more come - the click of heels, the slap of sandals, the soft swish of slippers. The sound swells, thousands of feet dashing through your mind, stumbling, running, tip-toeing closer, ever closer. The rush continues, a parade of feet echoing out of the absolute darkness, resounding through your mind in a dizzying array of clatter. Abruptly, they skid to a halt, leaving only the soft sound of tiny toes tucked into shoes too big darting into the fray. There is silence but for the beat of your heart drumming in your ears - one thud, two, then a chime crashes into your ears, two concurrent notes that vibrate sonorously into the inky black. Anybody home? Footsteps in the Night shuffle anxiously at the edge of the darkness as the last notes of the chime still echo into oblivion. Then - streamers of white fling themselves out of the dusk, looping and curling around your mind, engulfing your thoughts in a soft cocoon of tissue-thin wrapings. Laughter echoes obscenely, a low cackle, a deep chuckle, and high-pitched quaver. Chains rattle nearby, metal against metal as they creep ever closer. Just beyond your vision, there's a glow, a hint of tiny balls of light darting at the corner of your eye, disappearing the moment that your attention wanders in their direction. Smells rise from nowhere - the musty scent of old, abandoned rooms, the dull musk of pumpkins, the slightly fetid aroma of freshly turned earth. A cold wind cuts sharply through the paper shell, chilling to the core. Beneath your fingertips, the shell seems to soften, grow squishy with decay, then abruptly there is nothing - no scent, no sound, no sight. Utter blackness, which once more vibrates with the bass echoes of the chime. Anybody home? Footsteps in the Night still with surprise. You're here? Laughter echoes again, the soft giggles of children, the deeper, kindly chuckles of adults - all kindly meant. As if in reward for living through the horrors of the night, light filters in, hazy and indistinct, brightening the night to the soft gloaming of the false dawn. The aroma of fresh cake and sweet candy teases at the edges of your mind, mingling with the sharp spice of pumpkin pie. The cheerful crackle of a fire chases away the howling wind, burns through the cocoon holding your mind in thrall. There's an outpouring of welcome, of cheer and laughter and appreciation, all bundled into the soft liquid glow holding the black at bay. Softness surrounds you, smelling of life and love, enveloping you in its protective embrace as slowly the footsteps receed, taking the light, the sounds, the scents with them. Soon, there is nothing left but dark once more, but this one, at least, still echoes with the memory of home, hearth, and happiness. Then it is gone, and you are alone. Richly saturated in a warm mellow tone that might put a sparkling cider to shame, a hint of sunshine suffuses the broad curve of eggshell — this, perhaps one of the larger eggs of the whole clutch. Amber, of a hue rather tending towards an orange-ish hue rather than a clearer honey-gold, lies enameled in a veneer of perfect symmetry across the rounded shape of the ovoid in an even clear coating, the base coloration never wavering in its tint and hue except where the egg curves, and there, a faint tint of darker ocher and saffron suffuse the eggshell in shadowed bulges and arcs. Across the shell, faint line, deeper and darker than the base color, fool observers into believing they are trails, runnels carved shallowly into the actual shell itself, and a haphazard strand of bronze — the shade perfectly that of greeny-gold — weaves and wends its way across the shell, a confusing twisting pattern that fools the eye and the mind. Bountiful Harvest Feast greets your touch with a gentle cozy touch, like that of a matronly aunt or old granny drawing you into the warmth of their home and to the feat laid out before you. The scent of roasted wherry and fresh-baked redfruit pie lingers in your senses as the mind within the egg reaches out, wrapping you up into bundled warmth and comfort. Once there, you are tested, investigated and measured. Your memories, teased out one by one, are splashed across your thoughts — did you have a lover? One that you cared for very much? Or do you have a crush on someone that doesn't know who you are? Ah, there's a feeling of hopeless romance, sparkles of stars across the edges of your thoughts, and little pinky blobs floating about that could very well be hearts — the kind drawn by little weyrbrats during harper lessons. No matter! There's determination there too — perhaps with this one to guide you, you can accomplish much. But no promises can be made, not yet. You are tested once more, do you have a do or die attitude? But whether you do or not, the presence subsides a little, the feast still laid before you in tempting savory sweetness. Wouldn't you like a slice of pie? Bountiful Harvest Feast offers savory gourmet images — the kind that would likely have you salivating on the sands — but oh, be careful not to lick the eggshell! There, a flicker of green like salad greens accompany the scent of herb-fired herdbeast. Tempting teasing, such delicacies are offered, perhaps to throw you off your guard and allow the dragonet to investigate you further. What of the world beyond the darkness of the shell? It seems to be a question asked of you, put forth by a inquisitive and sharp-thinking mind. Your thoughts are rustled through the way autumn leaves are rustled through underfoot — each one picked out and examined further. Patience and tolerance are searched for. Are you measured and found wanting? Or have you met the standards? There is no answer forthcoming, the mind within fading a little. Won't you have some more pie? Bountiful Harvest Feast should know better than to offer you pie when there is none, but still the scent and taste of fresh-baked redfruit pie lingers about you. Your memories and thoughts have all been examined now, studied to the fullest as the unborn dragon mind seeks to learn more about you and see what the wide wide world out there has to offer. There is so much! It seems the world lies at your finger tips, and a rush of images comes flooding in — there's so much to be done out there, to enjoy life the way it was meant to be enjoyed, so many savory sights and harmonious sounds. Warmth and compassion rolls over you like a wave, snuffling you up into a seeming embrace that fades away into quiet secretiveness. There are mysteries here, ones that cannot be revealed until the proper time. So, you must wait and see, and learn. Once more, a sense of patience floats over you, a calming blanket that shrouds you. And then, the feast is gone, flickering away in a filmy sensation — and the mind within retreats, withdrawing from you as quickly as it has come. 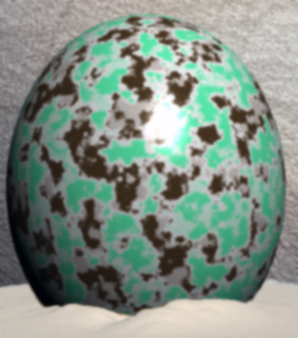 Crackling lines of thin black cover the shell of this blue-green egg in its entirety, tropical waters split by basalt reefs in etched, circular patterns like a dragon's footprints. The dark, starling black fades out grey and then in most places melts into the shell's natural hue, settling at the base of the egg where, in some places, the seawater-colored shell is entirely obscured by shadow. The shell is perpetually smooth, catching light and reflecting it back evenly. The Greatest Gift comes slowly, accompanied by the sweet chimes of silver bells. As the melody plays in the darkness, shapes form, misty figures dancing at the edge of your mind, hazy and indistinct. Voices murmur, unintelligible, coaxing answers unknowing from your thoughts as they ply at your memories. There is no discrimination in the recollections it dredges from your subconscious: sad memories, happy memories - family, friends, experiences, and desires, all of them are touched upon by unobtrusive fingers. For all the casual nature of the search, however, there is a definite lingering upon those rememberances which bring about a feeling of contentment, of joy, of home and hearth and all things love. Who were you, before now? The answer is dredged from your memories, until, contented, the silver bells slowly fade to a tinkling murmur, then fall silent, figures fading back into the empty nothingness, but for a single globe of light. Someone left a glow uncovered, a beacon in the dark. The Greatest Gift dances in once more, this time accompanied by the sweet, silvery voices of children. Though the words of the song themselves are lost within the music, it is a joyful beat that keeps time with the soft flow of warmth and color as it envelops your receptive mind. Memories are ignored - instead, slender fingers pluck thoughtfully at your current stream of consciousness, stretching forth to tease at the thoughts that linger topmost in your mind. Here, a face: someone special? An impression of a stranger? Breakfast, perhaps - or maybe the fading enjoyment of last night's supper. It seems most curious about what is making you tick at this moment: what do you feel, as you stand here, allowing an unborn dragon to skim your thoughts? Sad? Angry? Confused? Or do the sleepy warmth and soft, soothing strands of color ease you into a sense of well-being and contentment? Who are you, at this moment - the question comes, not in so many words, but in the constant delicate scrabble of its thoughts on yours. Pleased, it fades away, leaving behind that solitary, flickering light. A candle in the window, against the darkness of nothing at all. The Greatest Gift is preceeded this time by music, the stridant tone of a horn, announcing its arrival with a glorious fanfare, before fading into the soft, deep tones of the viola. Color swirls - reds and greens, silver and gold, thick streamers draping across your mind in festive glory as somewhere, in the distance, white wings flutter. Memories are ignored, thoughts are dismissed - no, this time it delves deep, plunging beyond those half-forgotten wisps of recollection, past the stream of consciousness that continues to murmur as every experience is catalogued. No, for it, desires. Wishes. Dreams. Is that you upon a dragon's back, with great ribbed wings of gold, no green, no blue, no brown, no bronze, no, it's a ship, dashing through the waves, the silvery backs of dolphins rising from the deeps. It's music, glorious music, splashing across a page as creative frenzy overtakes you. But wait, is that the scent of a well-baked bubbly pie? No, indeed, it's the heady perfume of the finest wine, carefully aged to perfection. Who will you be? The question lingers even as the music fades, the scents waft away, the streamers dissolve into nothingness. Soon, all is nothing more than a simple speck of light - a star, shining bright from the distance - then blink, and it is gone, and there's nothing there but your own thoughts.